Solo tickets went on sale today at 12:01 AM ET, and have already doubled the presales of Marvel's Black Panther in its first 24 hours of sales (on January 8th). The Solo presales represent one of 2018's best first day of presales, second only to Infinity War, which went on sale on Fandango on March 16th. Star Wars fans have been eagerly awaiting the pre-sale tickets and began to get worried when they weren't on sale six weeks before the release date, like they did for The Last Jedi. The wait for Solo pre-sale tickets was a bit longer than normal, but Star Wars Day was the best possible day for the tickets to go on sale. Today has been a big day for Lucasfilm and the spin-off, starting with the tickets going on sale, a new 360 degree VR experience video that gives Star Wars fans a unique view into the scene where Lando bets the Millennium Falcon away, as well as a brand-new clip which features Chewbacca becoming Han Solo's official co-pilot. If that wasn't enough, each Star Wars fan who buys one ticket or more on Fandango will receive a complimentary, exclusive Solo: A Star Wars Story movie poster while supplies last. The exclusive poster is available as a free gift to Fandango ticket-buyers from the company's movie merchandise marketplace, Fandango FanShop. The company has done similar promotions with Rogue One, The Force Awakens, and The Last Jedi over the last several years. Additionally, Fandango is also offering a Solo themed, limited edition, gift card that features exclusive artwork from the movie. The news of Solo's pre-sale tickets beating Black Panther is just the tip of the iceberg for the upcoming spin-off. It was also reported this week that the movie is projected to make over $170 million on its opening weekend, which is already a record in itself for highest grossing Memorial Day opening in North American box office history. All of this information flies in the face of Star Wars fans who have been very vocal about not wanting to see Solo: A Star Wars Story, quite possibly proving that the fans who have been talking the most smack were also the first in line to purchase pre-sale tickets this morning. Solo: A Star Wars Story opens in theaters on May 25th, which is also leading to the hype. 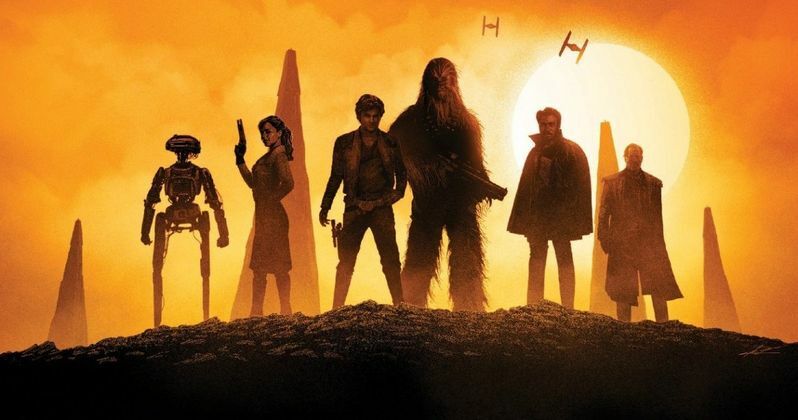 Stories from the production of the movie have had many Star Wars fans spooked, but the latest promotional material has gone a long way in squashing any fears that the movie will be anything less than a fun Star Wars movie. For those looking to avoid spoilers, it will be best to stay away from certain online forums after May 15th, which is when the movie screens at the Cannes Film Festival. And if you haven't purchased your Solo pre-sale tickets yet, you can do so at FandangoFanShop.